These roofs are the most affordable and practical available on the market today. With a wide selection of colors and styles, they can meet the vast majority of today’s roofing needs. They all come with a Class “A” fire rating, and have linited lifetime warranties. Certainteed Presidential Tri-Laminate Fiberglass Shingle roof in Country Gray pictured. In most cases, these attractive lightweight tiles can be used in a re-roof application. 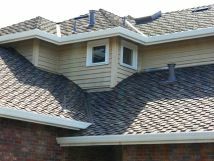 They are a Class “A” fire-rated roof, and come in a number of styles and profiles that can enhance the look of most any home. 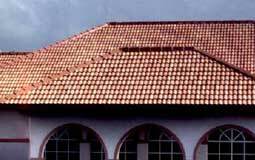 Monier Concrete Tile roof in Terra Cotta pictured. Beautiful cedar is back! Because of new fire treating technology, you can get a real cedar shake roof with up to a Class “A” fire-rating. We always hand pick our shakes, to assure that we install the finest shake roofs in the industry! Teal Prime-Cut heavy cedar shake roof pictured. Carlisle TPO single ply membrane, Westcoat ALX and MACoat mortar-resin deck coating systems, GE Enduris fluid-applied silicone membranes. IN ALMOST ALL CASES, WE PROVIDE A FULLY TRANSFERRABLE 10-YEAR WARRANTY ON WORKMANSHIP. Because we have been in business for over 25 years, this warranty has real value. Many competitors offer only a five year workmanship warranty.